I have always lived, hiked, and skied in far upstate New York in Plattsburgh. Throughout my childhood as a skier, I have read articles about locals losing limbs or even their lives in tragic frostbite and hypothermia related causes, often due to unawareness. Just this week, a man succumbed to hypothermia when his truck fell through the ice on Lake Champlain between New York and Vermont. 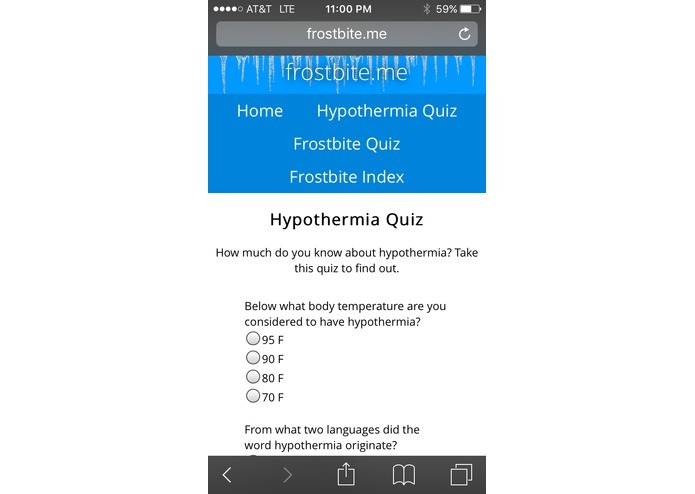 Having these troubling topics on our minds, we set out to build an interactive website to raise awareness about issues surrounding frostbite and hypothermia. 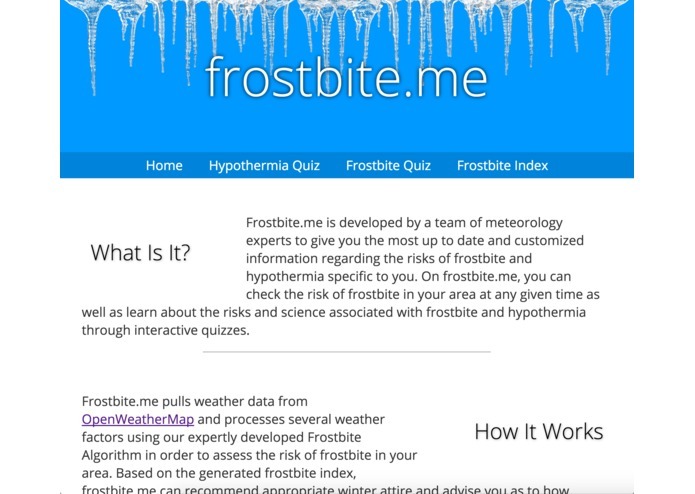 Frostbite.me is a multifaceted web app that contains several key components. 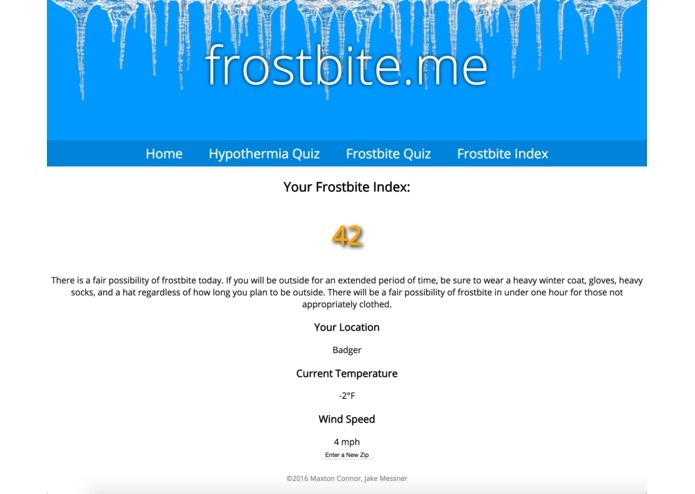 The primary page of frostbite.me is to generate a "Frostbite Index" based on an algorithm we have spent several weeks perfecting. The algorithm outputs an index, ranging from 0 to 100, representing frostbite danger in a specific locality at the current time. The index is accompanied by apparel and activity suggestions based on the risk of frostbite. 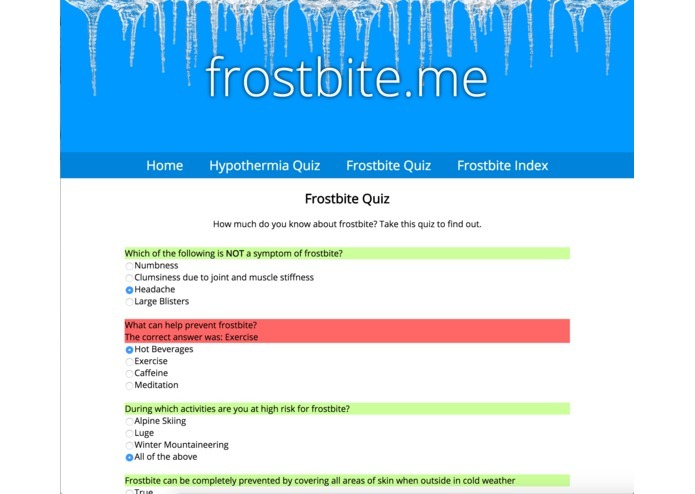 Frostbite.me additionally contains 10 question quizzes about frostbite and hypothermia in an effort to raise awareness about these conditions. I designed the project layout, wrote all the content, and created both quizzes.